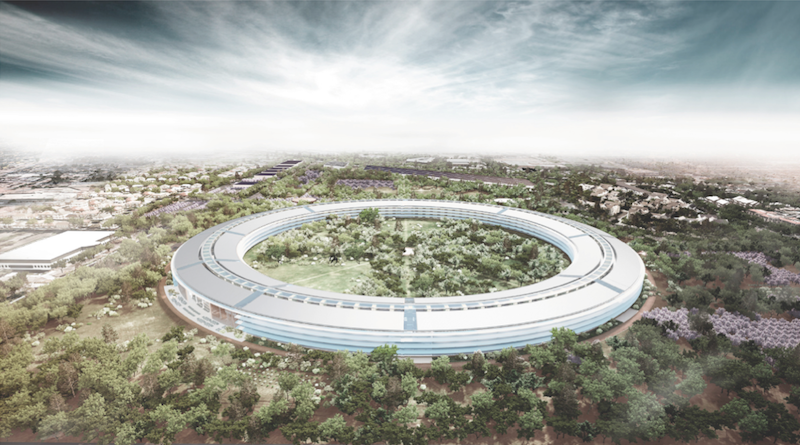 The architecture critic for the Los Angeles Times has panned Apple's proposed mega-campus in Cupertino, Calif., as lacking vision and resembling a "retrograde cocoon." Christopher Hawthorne profiled the project for the publication on Saturday, criticizing it for "removing the feeling of a collective metropolitan realm" by wrapping its workers in a suburban setting. He also challenged Cupertino city council members for not being inquisitive enough to question former Apple CEO Steve Jobs about the project during a June meeting to unveil the proposal. Hawthorne acknowledged the planned building's "futuristic gleam," while also noting that the project is a "doggedly old-fashioned proposal." He went on to compare it to the 1943 Pentagon building, which spans 1,566 feet, as compared to the 1,615-foot diameter of the circular building Apple hopes to build. The report also drew similarities between the project and "much of the suburban corporate architecture of the 1960s and '70s." The critic also went on to challenge Apple's assertion that the campus would be green, arguing instead that the site's "dependence on the car" undermines environmentally friendly efforts. Additionally, Hawthorne took issue with Apple's usual veil of secrecy surrounding the project. The company has yet to formally acknowledge the architect that designed the building, though Jobs has said that Apple hired "some of the best in the world" to work with. Preliminary plans for the campus made available by the city of Cupertino by London firm Foster + Partners, founded by renowned architect Norman Foster. According to the report, Apple's proposed "Campus 2 Project" is a classic example of "pastoral capitalism," a label coined by UC Berkeley professor Louise A. Mozingo. The term refers to an American tendency for a corporation "to turn its back on cities and stake a claim on the suburban pastoral idyll  isolated, proprietary, verdant, and disengaged from civic space," a description that Hawthorne believes perfectly fits Apple's planned headquarters. "The new Apple campus, which the company describes as "a serene and secure environment" for its employees, keeps itself aloof from the world around it to a degree that is unusual even in a part of California dominated by office parks. The proposed building is essentially one very long hallway connecting endlessly with itself," Hawthorne concluded. For his part, Jobs has asserted that Apple could "have a shot at building the best office building in the world," while also describing it as looking "a little like a spaceship landed." Cupertino Mayor Gilbert Wong has expressed certainty that the project will get approved. "There is no chance that we're saying no," he said in June. Wong also revealed last week that Apple is expected to begin work on a third campus after the Campus 2 project is finished in 2015. Jobs has said that Apple will quickly outgrow the new campus' 13,000 employee capacity given its current growth rates. Cupertino residents voiced concerns during a planning meeting last week that the new campus would increase traffic problems and bring about overwhelming growth. "Traffic is at the top of our list. 280 is a tragedy now, this isn't going to get any better. We're also concerned about public access to what will be Cupertino's Taj Mahal, with people from all over the world coming to visit it," said one resident.